There has been substantial progress on two fronts. The first is the integration of a high performance data base and graph generator designed for time trend graph production with a web server. This system is now online to serve up the Camalie Vineyards data acquired from 27 motes deployed all around the vineyard site. The data base which is integrated with Perl CGI scripts or PHP pages has speeded up graph generation by at least 10X compared to Crossbow's Moteview and Remtrol's Sensor Sentry. More data needs to accumulate in the data base before the performance gain can be confirmed for larger data sets. Thus far graph response times have all been under 5 seconds for 15 days worth of data taken on 10 minute intervals from 27 motes each sending 8 parameters in each packet. This is compared to 45 seconds for SensorSentry and as much as 10 minutes for Moteview. The Camalie data base consists of linear files containing multiple resolutions of the data instead of an indexed relational database. The Camalie data is fully accessible from the web. Go to: http://63.199.138.242/graphq.php . It includes interactive web pages for graph specification and generation. The database and graph server run on an inexpensive Linux machine running Apache some 85 miles away from the vineyard. This remote server connects to the gateway machine, also a Linux server, in the vineyard and captures the XML data stream coming from the gateway machine. It parses the XML data stream and inserts the data portion of the packets into the database on the graph server in Palo Alto. 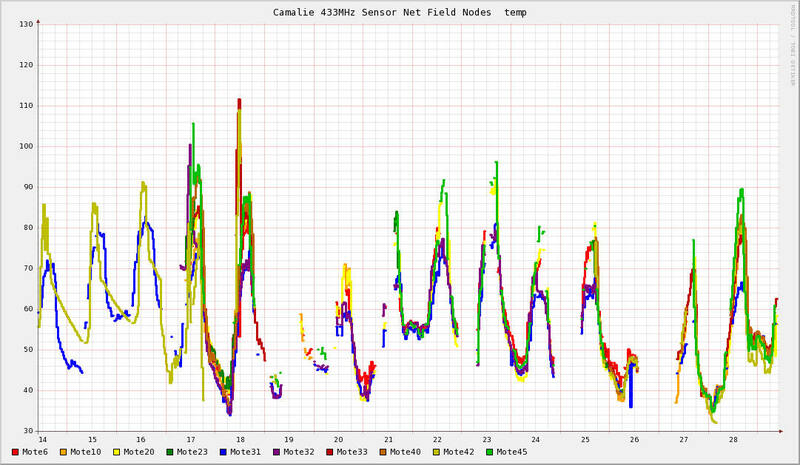 The second area of improvement has been in the mote mesh firmware itself which has been modified to be much more robust to drop outs and also produce accurate ambient temperature data. Alan Broad at Crossbow did the code development of these enhancements. Motes in the field have in general been upgraded over the last few months to more water proof configurations and solar power supplies in preparation for the 07 growing season. A total of 10 nodes, each with two soil moisture sensors and a soil temp sensor have now been deployed in the vineyard which is 4.4 acres. That's about 2 nodes/acre, which is 2.5 times more sensors than were in place in 06. A soil moisture sensing node #35 was deployed to a freshly planted vegetable garden in about 10 minutes on 4/8/07. Data immediately started showing up on web graphs with no configuration whatsoever. The next step is to exercise the current system through the entire 2007 growing season, upgrading the motes in the field for better reliability, fixing software bugs, improving the user interface and enhancing software robustness. The addition of one mote to monitor the water supply from a neighbor and actuate water transfers from that system is another short term goal.